The company which built the HD Ferries boat, HD1, has hit back at criticism she was not designed for open seas. Rob Provan, chief executive of rival Condor Ferries, suggested HD1's shipbuilder had said it was not designed to be used in open sea. But a spokeswoman for Incat said on Wednesday all its boats were designed for the open ocean. She added it was up to local licencing authorities to say whether a ferry was suitable for a route. Condor's claim has also been rejected by HD Ferries. The UK Marine Accident Investigation Branch (MAIB) is investigating an accident on 28 July in which the HD1 was in collision with a Condor ferry in Jersey Harbour. HD1 was left with several holes above the water line and the Condor ferry had slight scratches to its hull. 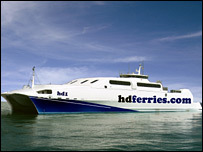 It was the second collision since HD Ferries started its Channel Island service to France in March. An HD Ferries captain resigned in May after HD1 collided with a Condor ferry in Jersey's harbour. An investigation found the performance of the captain was not satisfactory.